Crochet rabbit made of strong organic cotton. Length 30 cm. Fair trade from India by Global Affairs. Cuddle toy. Katy the Cat. 35 cm long. Made of colourful cotton in pink with pink and blue dress. Elephant rattle in colourful cotton. 13 x 23 cm. Global Affairs. Fair trade from India. Cuddle car rattle. Made of cotton. In green-blue. Fair trade by Global Affairs. Cuddle car rattle. Made of cotton. In green-blue or aqua-blue. Fair trade by Global Affairs. Elephant cuddle toy. 100% cotton. 19x23 cm. In many colourful designs. Fair trade by Global Affairs. Elephant cuddle toy. 100% cotton. Blue-red. Global Affairs. In many colourful designs. 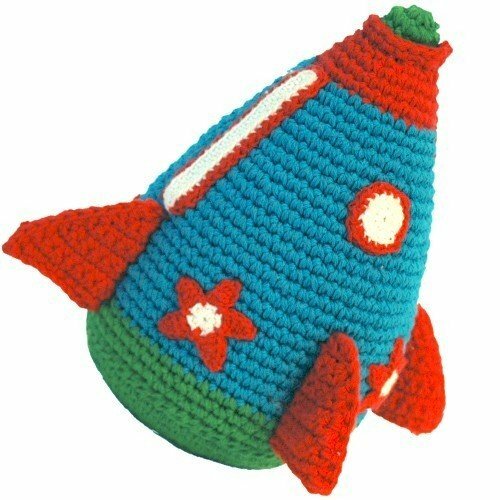 Cotton rattle spaceship. Crochet rattle. 18 x 10 cm. Handmade, fair trade from Global Affairs. Tiger doll Bill. Made of knitted cotton. Length 35 cm. fair trade by Global Affairs. Monkey doll. Made of knitted cotton. Length 35 cm. fair trade by Global Affairs. Fred Frogger knitted doll. Made of cotton. 36 cm. Handmade, fair trade from China by Global Affairs. Knitted doll harry Horse. Length 35 cm. Made of knitted cotton. Fair trade by Global Affairs. Colourful bunny, handknitted from soft cotton. Length: 40 cm. Fairtrade product by Global Affairs. Colourful bunny XL, handknitted from soft cotton. Length: 90 cm. Fairtrade product by Global Affairs. Handknitted bear. Smiling Sra or Cheerup Charlie. length 40 cm. Made of cotton. Unforunately, this item is sold out. Please go to our page Stoffen speelgoed en knuffels for the actual display.